There are many ways to keep your home cool this summer, and every summer after. From small tricks like air sealing to larger changes such as replacement windows, a cool, comfortable home is possible. Air sealing, insulation, and replacement windows are three services that many energy companies offer the keep the hot summer air out, and the cool, conditioned air in! You may be thinking, why is air sealing essential to keeping my home cool? Or maybe what causes so many leaks in my house? Well, over time different levels of moisture cause the hundreds of parts in your home to expand and contract causing small cracks which allow air in and out of your home. Another source of air leakage may come from an attic hatch or an attic drop-down stair. This is because there are many gaps and cracks that allow conditioned interior air to escape upward and contribute to the stack effect in your home. The leading cause of air leakage is from floors, walls, and ceilings, second, ducts, and third, your fireplace. Having an expert energy consultant come to your home to identify sources of air leakage would be an excellent idea. They will suggest ways to seal up your home so that your home will stay consistently cool all summer long. There are many ways to seal air leaks in your home. Caulk is commonly used to seal around molding trim and drywall while sheet metal can be used to seal gaps around chimneys. High temperature sealant can also be used to air-seal around chimneys along with gypsum board and cement board to fabricate caps that cover can lights in the attic space that are letting that hot summer air into your home. There’s no use in insulating your home without air sealing first! After your home has been fully inspected and sealed tight, it’s time for adequate insulation. Insulation slows the transfer of heat, helping your home stay consistently cool throughout the summer’s hot temperatures. The effectiveness of insulation is measured in its resistance to heat flow- R-value. The higher the R-value of the insulation, the more efficient the insulation is. The most common types of insulation are cellulose (R-3.8 per in. ), loose-fill fiberglass (R-3.4 per in. ), fiberglass batt (R-3.2-3.8 per in. ), spray foam (up to R-7 per in. ), and rigid foam (R-3.8 to R-8.7 per in.). This wide variety of insulation may seem daunting, but with the help of an energy expert, the choice will be simple. 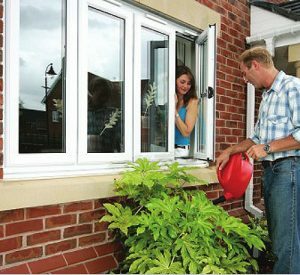 Replacement windows may not be first on your list of energy improvements, but they will contribute to the cool temperature in your home. They are not only a visually appealing change to your home, but they also keep that cool conditioned air in when they are properly insulated with weatherstripping, and are fit snugly into their frame. Windows with low-emissivity (Low-E) are also a great investment that will keep your home cool on those especially hot summer days. Low-E coating on windows control the heat transferred through the window. It is a type of insulated glazing that is virtually invisible, microscopically thin, and is applied directly on the surface of one or more panes of glass. Windows with this coating keep the sun’s heat out of the house, and also last 10-15 years without peeling, save energy, increase comfort, and reduce fabric fading.